Besides systemic environmental issues, most of the villages in the Vardenis sub-region face a different kind of public health policy issue: they use diesel for heating the schools. Some of the villages don’t have gas distribution for heating, others simply can’t afford to replace the old and rotten radiators and tubes inherited from the Soviet era with the modern versions. As a result, they end up burning diesel in stoves in each class. This makes things more complicated: on the one hand, it doesn’t make the classrooms warm enough and the schoolchildren are still cold. On the other hand, the smell is terrible and the fumes pose significant threats to people’s health. Under such conditions students continue to attend classes and teachers do their best not to keep knowledge frozen in books, but to help it come to life by application. We want to thank Fatima Poladyan for participating in the ToT and for her eagerness to be a part of the initiative to educate young minds to take responsibility and care for their communities. 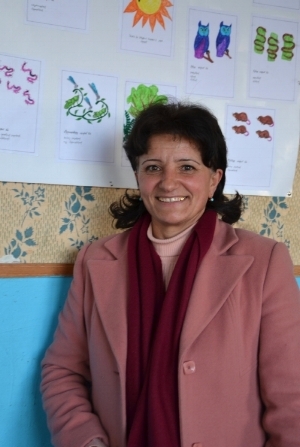 Fatima Poladyan has been taking on the responsibility of teaching young generations for 28 years. The school where she works is in Lchavan, a village in the Vardenis sub-region, Gegharqunik Marz. Mrs. Poladyan is one of the teachers participating in the “Vardenis Environmental Education Initiative“. Lchavan is near Lake Sevan and, like other villages in the area, borrows its name from the lake: “Lchavan” means “town of lake”. Lchavan faces the same environmental problems as all of the other villages in the neighborhood, but proper waste management is again emphasized as people typically burn or bury waste. These practices lead to other serious public health problems that are not always recognized as being related to improper waste disposal.